Giving as used in the term “giving back” is typically meant as giving a gift that is not obligated by contract, written or otherwise. This term has for many years disturbed me, and I offer to share with you my feelings on this subject. My reason for examining what at first might appear to be only an issue of semantics is that I fear the acceptance of this term and the philosophy behind it is damaging to human’s intellectual welfare. “Community” is an abstraction, and should be recognized as appropriate in some contexts while not in others. In August of 2005 four men sexually assaulted a couple ladies in Jackson, Wyoming. That same month, there were surely four people that donated to a young lady’s scholarship fund. One of these ladies will credit individuals with their action and one will credit her educational success with being helped by her “community.” Is it fair to say that the young women who were sexually assaulted were “raped by the community?” Of course not! Individuals do things to and for individuals, and the collectivist notion of “community” is very destructive. This fallacy of removing personal responsibility is widespread, and in my opinion very harmful. We don’t blame individuals for criminally wasteful spending but rather the “City Council” or “Congress” or “County Commissioners.” While these abstractions are useful linguistically for expediency in referring to groups of individuals, they remove personal responsibility. 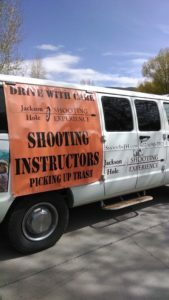 Each spring in Jackson Hole there is a Community Cleanup in which a few hundred individual volunteers clean the debris from the roadways in our area. Comments and accolades about our “community coming together” are extolled. In fact, our government jurisdiction of Teton County has a population of 21,000 individuals. Can we REALLY congratulate the collective when only 1 out of 70 individuals among them perform a deed? Of course not! Understanding that there is a decisive difference between community and individuals that make up a community is very important. So that one does not have to say they live near John & Sue & Tina & Hank & Terri & 17,000 other names; it is certainly fine to say that one lives in the Jackson Hole community. To say that the community cleans roadways, rapes or gives to those in need it not true. Individuals do all of these things, but again, “community” is simply an abstraction. To illustrate this concept, let’s use Joe as an example. Joe was born in Mytowne to a poor family. He began shoveling dog poop at age 12 for extra money, and this led him to lawn mowing jobs as well. Several of his clients, A & B, recognized his work ethic and sponsored him on a high school ski trip. Another client C paid for him to attend a small business development seminar in Nearbytowne when he was 16. Meanwhile, 28 local hunters donated money to a shooting sports program that Joe participated in as a young adult. These benefits that Joe received were based partially on merit and some were simply because of some individuals’ good will. In fact, Joe was not “giving back” to anyone. He was simply appreciative of the personal growth and joy he had experienced through shooting and wanted other youth to enjoy similar feelings. He knew that each time he drove by the shooting range on a Tuesday evening and heard shots being fired, that he would feel happiness knowing it was likely one of the guns he donated that was bringing someone else joy. This new generation of youth included Tommy. Because Tommy had never “given” anything to Joe, it would be impossible for Joe to “give back” to Tommy. Joe considered that since Tommy was part of his community, maybe from a collectivist standpoint Joe WAS “giving back” but if fact this was not the case. The problem here is that we are again removing individuality from the scenario. Rather that teaching our children that the non-theist gay man down the street has his own set of values as does the Baptist straight man the next door down, and that every person gets to choose their own values, we instead begin to extol the “community values” based on the most vocal and powerful 51% individual’s preferences, often the result of mindless absorption of “news” from a subject entertainment company like CNN, FOX or NPR. This demagoguery is commonly accepted today and is manipulated by people on different sides of an issue. Should we stop using the term “community?” No, we should simply understand that it is only an abstraction. Should we stop “giving” to causes we like? No, we should simply understand that in almost all cases, we are not giving “back” and that we are not morally superior for giving. Author shepardPosted on October 15, 2013 February 19, 2017 Categories BlogTags Shepard Humphries on "Giving Back to the Community"
Next Next post: Why Do Poor Folks Not Just Get a Job?